Secondly, half a year ago the monopoly of expensive FireWire card readers on the high-speed devices was damaged. New models with the USB 2.0 interface provide a fairly good speed and are as cheap as yesterday's USB 1.1. As a result, card readers became much more popular, and the increased card size put forward a problem of time of transferring shots to PC (otherwise, it might take half an hour to rewrite a 1GB card in case of direct connection of cameras to PC). The issue of memory card speed is getting more topical. I have decided not to use programs other than the HD Tach 2.61 because its scores are sufficient. Anyway, its scores were earlier used as primary as well. The hardware of the test PC has changed a little - instead of the Athlon XP 1900+ (12x133) we use Athlon XP 2000+ (10x166). But this replacement doesn't affect results of FireWire devices. What can have an effect is an FW controller from Texas Instruments (on the SB Audigy card) and Windows XP Rus + SP1, i.e. the testbed remains actually the same (as we found out, these parameters do not tell upon the outcome). In the tests we used a noname IEEE1394 6-in-1 card reader described last time. But the situation wasn't that cloudless. Even at that time many preferred to pay more money to feel assured that it won't fall and get damaged. Also, they didn't want to carry a bucket of batteries all the time. 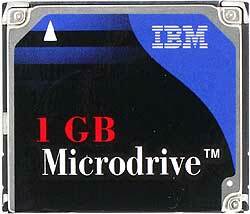 The Microdrive was losing its attractiveness as the price of memory cards fell down. 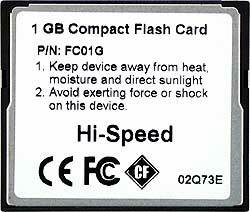 Besides, the speed of memory cards was getting more topical, which was a weak point of IBM's baby. If they couldn't make a faster and more protected unit they should have made a twice more sizable unit at a small price increase (2 GB on one card would be very attractive), but instead IBM almost strangled its baby. Last year I couldn't find it on the market. Now the situation looks a bit better — this direction was sold to Hitachi which will continue developing this drive. Since the data on the diagrams are given average, you can study the detailed diagrams yourselves because scores of a hard drive depend on its area. 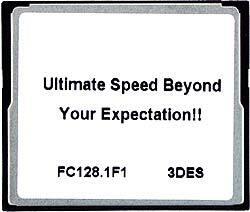 This card was tested last year when we had only a 128MB sample at hand. This size is not enough today. Besides, we tested it on a slow card reader. Today it's time to test a 1GB sample. We thus can compare the old results of PQI with its new achievements. It's interesting that on the front and back sides instead of 'Hi-Speed 24X' it's written only 'Hi-Speed' :) Probably, the speed of 24x is not not what one can boast of this year. 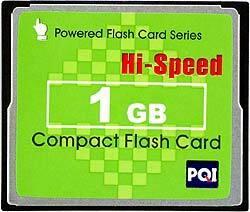 A strong point of SimpleTech's cards is a life warranty, but the speed is usually moderate. 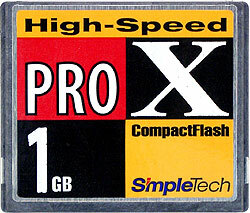 The Pro X series was released for more demanding users. 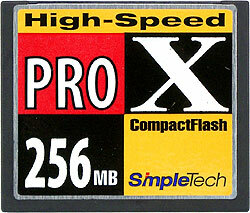 Today we have a couple of cards of this line - 256 MB and 1 GB. The card package is changed a little - now it says that the write speed reaches 4 MB/s. We will check it in the tests. 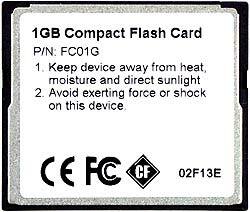 If the low-level model looks ordinary, the top solution is the only flash card of the CompactFlash Type II interface I tested for the last year. 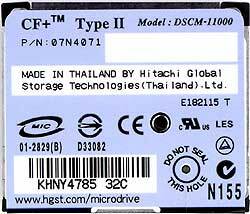 Frankly speaking, I thought that such cards are not produced anymore and such slots are used only for compatibility with the Microdrive. However, the difference between Type I and Type II is not vital for an end-user. A user can feel the difference only if his device has a Type I slot because it doesn't suit for Type II cards. 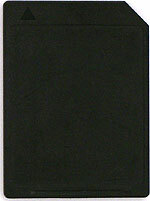 But it happens seldom, and such cards are entirely identical except the width. 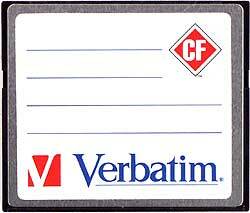 Is a standard 5-year warranty for flash cards enough or you want a life warranty? If you need the latter, there is one more manufacturer in addition to Delkin Devices and Simple Technology. This is Verbatim which is known for a wide range of products from usual diskettes to DVD-RW. Now it deals in memory cards as well. We have taken two cards to test - 256 MB and 1 GB to find out how well they cope with their duties (as I mentioned before, they will serve us as reference sizes instead of earlier used 128 and 512 MB). Thešhard drive can't compete against memory cards in the access time. However, there are even greater record-breakers coming from Sandisk :) The other companies make it around 1 ms, while the Microdrive shows 20 ms more (note that I had to adjust the height of the bars on the diagram). The other participants have this parameter within the rational bounds. The outsiders are 1GB PQI Hi-Speed and Verbatim which are twice slower than the leaders, but it's less than 1 ms, and this difference can be actually ignored. 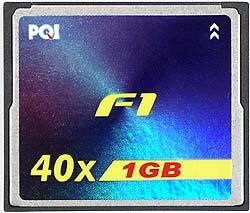 The PQI F1 has good results so far, but this is not an end yet. The Delkin eFilm Pro keeps the first position in the read speed, the new Digitex Optimal comes the second. The PQI F1 1 Gb and Verbatim 256 MB showed scores very close to the latter. 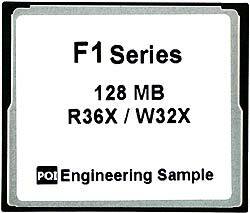 The scores of the "little" F1 are much more modest but it's able to stand against the Apacer Photo Steno Pro — the former CompactFlash leader. The PQI Hi-Speed has hardly reached the 4 MB/s (but it's pretty good considering that it's not a top solution but an average one). They others haven't reached it at all. That is why if the most important aspect is a speed of transferring shots to PC, and the write speed is limited by a photo camera, mind this diagram when choosing a card. If you don't need such a compromise go with the first and last variants. The 1Gbit F1 has climbed up the peak, with the Delkin eFilm Pro taking the second place. 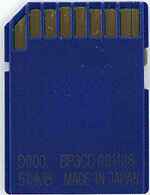 The second runner among the today's contestants is the 128 MB card of the same series. It's interesting that 32È of PQI is faster than 30È of Kingmax but slower than 30È of Transcend — x's can differ :) The SimpleTech Pro X 256 MB has justified what's written on the package, in contrast to the more sizable version. However, 3 MB/s is not that bad, plus it has some reserve as the controller can be taken from the 256 MB version. Both Verbatim cards run at around 3 MB/s though the bigger one is faster this time (in reading it was slower). So, all relatively new cards easily pass the 3 MB/s mark in writing operations. Some time ago that was considered a very high value achievable only for leaders. The old guys have lower scores, but if the PQI Hi-Speed has at least 2600 KB/s (which is enough for most models of photo cameras especially not latest ones), the speed of the Microdrive doesn't look impressive at all. The only strong point of this device is its price. Among downsides are a low write speed, high power consumption, and poor shake protection. As to the memory cards, the competition looks usual, there is a new leader and an overall growth of all scores. First I was surprised seeing that PQI was fighting for the first place. However, the company is working hard in this field. But the final word is not said yet - the other manufacturers are not dormant either. Transcend is preparing to make a jump from current 30È to 45È. It can help the company return its first place (especially because its x's are weightier than those of other card makers). Let's wait and see. So, the flash is developing, and no limits are noticeable so far (they can be actually moved away; for example, the limitations of the CompactFlash interface were lifted in advance). Such development negatively tells upon alternative data storage technologies. Flash memory is not ready to press out standard hard drives (though it's not that long to wait;)), but this niche is quite successful anyway. The constantly growing size and speed coupled with pricecuts didn't let the Iomega PocketZip live a lot, and the Data Play died unborn (the company went bankrupt when the new technology was entering the market). 80 mm CD failed to carve its way into portable equipment (now 80mm DVD are coming onto the scene:)), and the only device that snatched a bit of the market (only thanks to its compatibility with memory cards) is in a pretty complicated position. Yet a year ago the Microdrive was a competitive device, but today one has to think well before buying it. 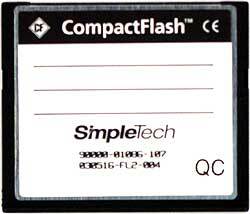 We talked about the CompactFlash standard so far, and none of theš alternativetechnologies could stand against flash cards in another package (physical dimensions are important). There are some fields of application where even CF looks too bulky. Now let's see what we have in the sphere of little ones. Last time I wrote that we wouldn't test cards of this type anymore. But although the cards weren't expected anymore, some samples of 256 MB were nonetheless released by several companies. Let's see what they can offer. The company kept its word and released a 256MB card, but it has nothing in common with the photos demonstrated before :) Earlier it had a beautiful sticker, now the MMC card looks like an ordinary card with a plastic protection cover. I like that technocratic approach more than a standard one. But let's estimate its performance as it's more important than appearance. I've got 5 noname cards made in Taiwan. Three of them will be examined in the next section and two right now: MMC 128 and 256 MB. The look identical except the two figures. The MMC had some reserve, and the new version has realized it. 20% growth. It's not bad. The read speed is definitely limited by the interface. However, there is some advantage though it doesn't exceed 1%. Although they couldn't bring the write speed up to the level of the read one, the growth is still 20%. Note that both ïeh cards behave equally. I suppose that the manufacturers will start using new controllers developed for 256MB cards in the whole MMC line, that is why such cards look more advantageous now than a couple of months ago. 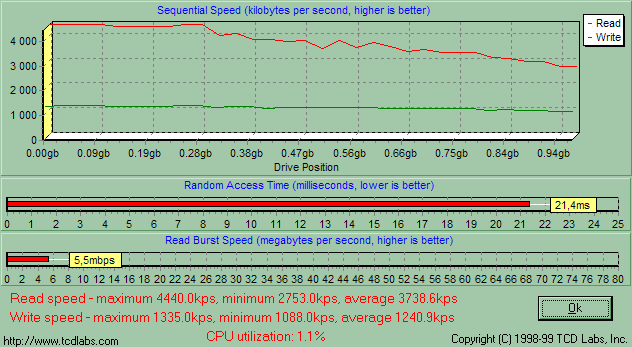 Kingmax šis more efficient, and the gap is the same as between the fastest and slowest 128MB cards from the old lots. The performance has grown a little, but the results are incomparable to the new SD cards used in the same fields of application or to CompactFlash. The double size is, at the first sight, a noticeable step forward. They were going to give up the MMC standard even at the card size of 64 MB, but at that time the market wasn't ready for the full transition to the SD (mostly because of its price). As a result, all card makers brought out 128 MB cards but remember that not every device supporting MMC can handle a 128 MB card. Today, however, SD has replaced MMC almost entirely. SD controllers are compatible with MMC but as far as I know some players that excellently work with SD 256 refuse to deal with MMC 256. On the other hand, SD cards sell at almost the same price and work much faster, not to mention other advantages of the standard. 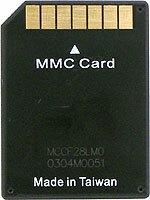 As to devices designed for MMC, many of them do not support even MMC 128. Besides, most of MMC devices are dated solutions, and it's better to replace them than to revive. The only company that doesn't ignore MMC is Nokia, but I don't see any reasons why they wouldn't leave it. The only version is that Nokia fetched a big lot of MMC controllers at a low price and now it's thinking how to use them. Whether this model works with MMC 256 cards or new firmware is needed is not clear yet. The Siemens Sl45 definitely supports them but what for does it need so much memory? For music? Then it would be better to get a separate player (especially because of the power supply problem and because it's impossible to use good headphones). No more multimedia functions are supported by this phone with a monochrome display and without GPRS. I do not believe that the manufacturers of flash memory worked so hard (extended the standard and reanimated the old corpse) only to support owners of a single dated phone. Let's wait and see. Maybe, the volumes of production won't be large and soon run short. We've already discussed performance of the basic card reader in operation with cards of this format: when we tested the cards and multiformat card readers. At that time I had only cards of the large size and from only one company. Today we have several cards. At the initial stage of SD card development they were going to make SD both back and directly compatible with MMC so that a new card could work in old devices. A bit later they gave up this idea. Plus, SD controllers work with MMC only in the MMC controller emulation mode (i.e. a controller supporting only SD is quite possible). But they gave up that idea when the controller development was almost finished. And SD inherited the same length and width of the card, and had the same thickness in the place of pins and side rails in order to make universal SD/MMC slots. 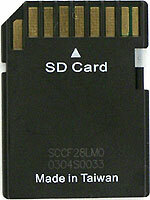 The basic version of the SD card didn't match MMC slots because such cards were thicker in the center. But there was also a compatible version identical to MMC in all dimensions and different only in the number of pins. However such slim SDs didn't have a write protection slider which was one the main advantages of that format. 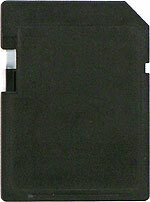 As a result, most SD cards are thick and come with such slider. 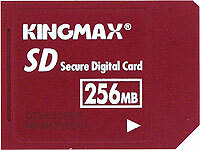 But this year Kingmax decided to revive that format and released a SD-slim card. That's a logical step taking into account the cost cuts. As to copy protection, people hardly use it. That was an unnecessary element and it reduced reliability. 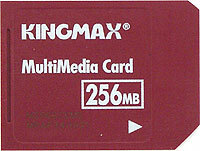 Kingmax Slim cards look like Kingmax MMC, i.e. 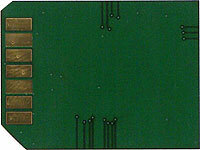 a printed-circuit board with a plastic protection cover, thin and light. 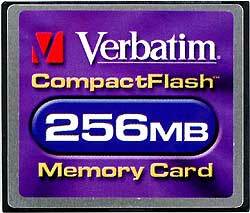 Their performance will be estimated with a 256MB slim card. We have three "abstract" cards to test - 128, 256 and 512 MB. The photo shows only one because they differ only in two symbols (the only outward difference). In this case we tested a 512 MB card. That was very interesting to compare different SD cards of the maximum size available on the market. The newer controllers in the large-size cards demonstrate a lower access time. The PQI is equal to the SimpleTech (a former leader), while the Kingmax and all ïeh cards work a bit faster. All the cards have very close scores except the very old ones. It's clear that the cards are limited by something. Now let's have a look at their white speed. The scores of the ïeh and Kingmax are similar to that of the SimpleTech 256, and the PQI has caught up with the ST 512 at the 4 MB/s mark. 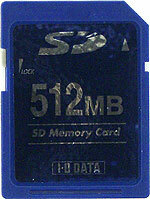 As to the standard, the theoretical speed of SD cards is easy to calculate. The synchronization frequency makes 25 MHz, and the one-bit channel can thus theoretically pump 25 Mbit/s or 3.125 MB/s. There are 4 channels at most, that is why the maximum speed is 100 Mbit/s or 12.5 MB/s. 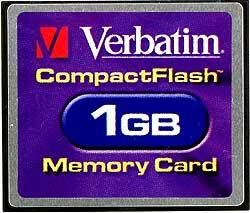 It's less than 16.6 MB/s for CompactFlash, the developers of which are working on the new standard in order to move the speed ceiling away. However, the real channel throughput is about 2 MB/s (it proves once again that the serial buses ensure only 2/3 of the peak performance), that is why the SD has its peak at around 8 MB/s. At the same time, modern 4-channel cards ensure only 6 MB/s in reading operations and about 5 MB/s in writing operations. The SD might soon lose its prospects as well, and it's better to start working on extending the standard right now. 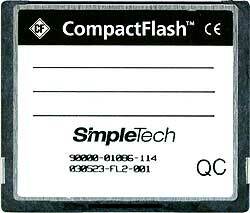 Just look at the CompactFlash which is already extending though it has reserves even without it. The serial interface can help the SD a lot. At the current stage of development it's possible to make a transition to the sampling frequency of 100 MHz with parallel improvement of data transfer algorithms. As a result, it can be not that difficult to release a new format entirely compatible with the SD and with the speed of dozens megabytes per second. First of all, the good old CompactFlash is not going to give up: 1 GB has become popular, the speed of the CF interface is constantly growing up, and its extension is expected soon. The SecureDigital cards develop slower: although the fastest models do not yield to šthe best CF cards, such cards fall behind in size - even 512 MB remain expensive and exotic. Besides, limitations of this interface can be expected very soon. The life of MMC was extended once again, but I don't understand why. I didn't test SmartMedia cards because no changes in this area are expected. As to xD Picture cards, there is almost nothing to test them with though cards and devices that support them are selling in numbers, and such situation is fraught with serious consequences.